What Do Long Distance Running and Getting Out of Debt Have In Common? I walked down my driveway and accelerated into my normal running pace as I crossed the line separating the concrete of my driveway and the asphalt of the road. I was excited to head out for a Saturday morning run, the target distance being five miles. I hadn’t run outside much lately but I had been doing a lot of treadmill running, and was sure it would all come back to me. I was expecting an effortless run, as I remembered enjoying so many previous times. What actually followed was seventy minutes of alternating between running, walking, and cursing the idea of even trying to run on that hot and humid morning. I had completely forgotten how different running outside on asphalt was, and how much planning and preparation I normally put into my Saturday runs. I thought back to last Summer when I was training for a marathon and doing Saturday long runs of 12-18 miles. I reminded myself exactly what I had done each week to successfully complete those runs. Being only six payments away from eliminating $109,000 of credit card debt, I feel like I’ve been running a financial marathon. I couldn’t help myself from drawing comparisons between a Saturday morning long run, and what we’ve had to do to get this far in our Debt Management Program. I normally start mentally preparing for a Saturday run a few days ahead of time. I would remind myself several times each day that I am going to be waking up on Saturday morning, and going for a run. I also keep reminding myself that I will be running for a significant amount of time. I envision starting, and successfully finishing. Before starting down a path of paying off your debt, we had to have the right state of mind. We knew it was going to take us close to five years, and we had admit to ourselves that we were going have to make major changes in our lifestyle to be successful. I break my run down into smaller pieces. When I was marathon training and my Saturday long runs were 12-18 miles long I would break my run into four mile pieces. As I completed each piece I would make sure I congratulated myself and fist pumped into the air in a physical display of victory. I broke down our debt management plan into milestones of time including one year, two years, and halfway through our program. When we reached a point where we had only ten payments left, we began counting down. 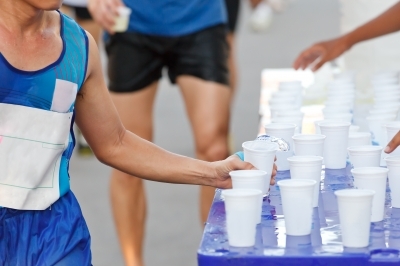 It’s important to stay hydrated while running long distances. Each intermediary goal would end back at my house where I would drink Gatorade waiting for me in a cooler, apply lotion to areas that may chafe, stretch for a minute or two and then begin the next piece of my run. As we’ve gone through the last four and a half years, an important part of journey had been to find things that help keep us motivated to keep going. Encouragement from family and friends has been key. We also occasionally pause to re-evaluate all our expenses and make additional cuts in our spending. These efforts have given our budget a shot of extra funds that reinforces that we are headed in the right direction. When a long run is planned, beginning with an all out sprint is a horrible idea. You’ll expend all your energy and won’t have a chance at finishing. I personally start out at a very slow pace, let my legs and body warm up and get into a rhythm. I seem to just naturally and gradually increase my speed to my normal cruising pace that I can maintain for long periods of time. 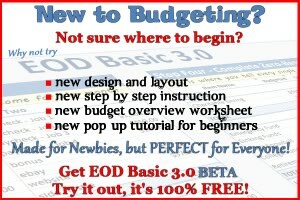 I had read about people who go full frugal, cutting all discretionary spending from their budget. While that may work for some people, I could not personally maintain that kind of pace for an extended period of time. Our debt management program requires a sizable payment every month. Vonnie and I decided that in order for us to be successful and stick with our program, any funds that were left over after paying all our bills would be used to enjoy life. This weekend’s target distance was 6 miles, and I decided to utilize all of these same strategies. I woke up Saturday morning ready to run. I took off down the driveway on my first of three legs of my run, leaving my cooler of supplies next to the front door. After miles two and four I stopped back at my house for hydration, lubrication and a bit of rest. I completed my six mile run in just under an hour feeling great. In six more payments, we will complete our debt management program. We will be successful because we’ve used many of the same techniques as I use to prepare and execute my Saturday long runs. We will also stand at the finish line with a similar feeling of accomplishment. How have you approached your get out of debt journey? Thank you, thank you, thank you for this wonderful post and analogy. I really think it will resonate with a lot of people. I can’t wait to read your debt free post!!! You’re welcome, You’re welcome, you’re welcome, Michelle! 🙂 I’m looking forward to writing that debt free post – just a few more months!!! Thanks so much for reading! Like any big task, the best way to tackle debts is to break it down into not-so-overwhelming steps and set many sub-goals along the way to The Big Goal: being debt free. I think your analogy to long distance running is very apt. With both, there’s going to be setbacks, frustration, and despair along the way, but also exuberance and in the end satisfaction and financial reward. That’s exactly right, Kurt – as someone that has ran three marathons there are times during the race that you think you’re going to break down and give up. You simply want to collapse on the roadside. But you keep going, keep pushing – and there’s NOTHING like the feeling of crossing that finish line. I imagine I’ll feel exactly like that on February 28th when we make our last payment! I’m 1 yr & 1 month away from paying off mine and I keep thinking….grrrr IT’S A WHOLE YEAR! I paid off one of my cards a couple of months ago (early) & it snowballed the payment into the next lowest balance. So, I’ll be paid off even earlier. I just told myself that it’s another 12 months and I’ll be debt free…and, what do you know, my whole reaction was completely different. To the point of…well, what do you know, it’s only 12 more payments (and maybe even 11 or 10). Thanks again and congratulations to you and your family for your debt free dream coming true very soon! That’s awesome, Kathy – that one year will seem to go by like the snap of a finger. I just went back and ready my post from the half way point….it seems like I just wrote it! Great to hear from you! I never get tired of the “paying off debt is like running a marathon” comparison. As someone who is trying to both become debt free AND more fit, I think it’s always good to see the similarities between the two goals. The long run. I remember those. I did my first marathon before cells had GPS mapping as an easy app (that sounds like I’m old but it wasn’t that long ago). I’d have to take time and map out where I was going to run to make sure I made my training distance. I also had to plan out possible stops if needed. Getting out of debt needs planning too. Another thing, people want instant gratification. We want it now! When we don’t get it we give up. But you have to slow down and put your miles in. Once you ease off and appreciate the miles you need to train then it gets easier and you aren’t struggling the whole time (not fun by the way). You don’t get out of debt super quick either. It takes time. I still map my runs out the old fashioned way, Glen….I get in my car and drive them – lol. That’s a great point – people want things NOW – I know this all too well as that sense of entitlement is part of the reason we ended up so deep in debt. It’s a change in mindset – people have to get back to the perspective that if you want something you have to EARN it – and the item you’ve worked for will be so much more appreciated when you purchase it AFTER you’ve worked hard to save up the cash to buy it. Thanks for stopping by, Glen! Lately, I think our debt repayment is more like a long cycling road race than a marathon. That’s because we’ve had to stop for months to save up for the removal of a tree from our backyard ($2,000) and a new roof ($10,000). It reminds me of a cyclist who has to withdraw from the race to pump up the tires or to replace the tubes. It’s frustrating and feels like a time sink, but it’s necessary. The part I have to keep reminding myself of is that we’re not getting into more debt with these big expenses – as we would have in the past. We’re paying them outright. Wow, Prudence that’s awesome that you’re able to handle those expenses by paying them outright – that’s a true sign that you’re handling your finances correctly! Keep pushing and you’ll be out of debt before you know it. We can definitely see that finish line…….it feels GREAT! Great analogy between the running (and breaking it into pieces) and the debt reduction. Recently, I’ve been feeling frustrated / discouraged by the length of time it’ll take me to payoff all six of my “senseless” debts (I’ve excluded mortgage and student loan as I see those differently than credit cards and 401(k) loans). However, when I narrow my focus to only the first payoff date, the goal seems muich more attainable. Exactly, Daniel – One Goal at a time! Once you achieve one of those goals you get a feeling of accomplishment that will give you motivation to keep going. Good luck on your journey, Daniel, stop back again soon! Thanks and thanks, Mackenzie – The entire Pizel family is getting VERY excited – February 28th here we come! These are some pretty interesting comparisons between paying off debt and running. It’s very important to be patient and persistent in your efforts, more like a long distance run. Your blog post title reminds me of a quote about improving credit ratings, ‘it’s more of a marathon than a sprint’. And the same goes for a lot of other financial goals. Very True, Tammy – retirement planning, and saving up CASH for all your purposes does take a lot of patience. The great thing about saving up CASH for all your purchases is that you don’t have to give a rip about your credit rating!